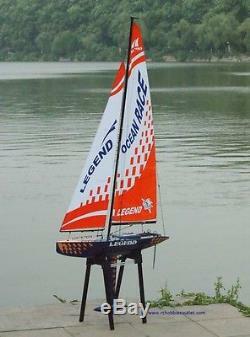 NEW LEGEND RADIO CONTROL RACING RC SAILBOAT. This is not a toy! Competition Synthetic Polyester Fabric Sails. Large Area Deep Water Rudder. New 2.4 G Radio. Factory Sealed Box, Unopened, Everything is Keeping in the Original Manufactory Status. The new Legend is a ready-to-sail RC Competition Yacht Sailboat that has been designed from the keel up to handle like a full-scale racing yacht - not a toy like other RC sailboats. The hull is made of Composite fibreglass (FRP) giving maximum strength as well as a smooth and slippery surface. The Mast is made of high strength aluminum alloy and the surface is oxygenation treatment to reduce corrosion in salt water. The rig is of professional quality and very rigid even in high winds further increasing efficiency and Speed. It's very easy to assembly or adjust by yourself. The sail is made of Synthetic High Density Terylene fabric which is resistant to stretching under high wind gusts and and the angles are further strengthened. The deck is decorated with some plastic fittings making the realistic look. The large scale size of the Legend also make it a stunning exhibit in a room or window. Here's just a few of the features that make this Low-drag composite hull design with large 900mm over-all length. Removable racing keel, with ballast-bulb, large area deep-water rudder that, working together, keep the Legend on precisely controlled headings at all times. All rigging is mounted up to a super-ridged Alloy main mast and fully proportional sail winch that allow the sails to be trimmed for absolutely any combination of wind conditions and heading dynamic such as: close reach, broad reach or running with the wind. From stays to clew fasteners, The Legend RC Sailboat is regatta ready in minutes from opening the box. Even the pre-mounted Radio Control is in its watertight compartment. The new 2.4 Radio means longer range, no crystals, no external interference and no interference from other boats. The intelligent digital radio automatically switches between different channels so you will never have a boat on the same channel. Not to mention no long aerials to snap on the. This Legend Sailboat comes with a stand. Stunning Boat with Light Weight Fibre Glass Construction. NEW LEGEND RADIO CONTROL RACING SAILBOAT. Type: Radio Control Racing Yacht. Hull Material: All Fibre Glass Construction. We carry a valid business license in Canada, and provide a valid invoice. R/C Racing Yacht with stand. 2 Channel 2.4G Radio Control. Ready to run (just requires AA batteries for Radio Control). This boat is not suitable for anyone under the age of 12. This item may contain small parts which are dangerous to small children. The item "RC Sail Boat Yacht Sailboat Legend 2.4G Radio Remote Control RTR" is in sale since Sunday, July 17, 2016. This item is in the category "Toys & Hobbies\Radio Control & Control Line\RC Model Vehicles & Kits\Boats & Watercraft". The seller is "bestrcfun" and is located in Mississauga, Ontario. This item can be shipped to Canada, to United States.